In conjunction with The British Museum Radio 4 have been running this series called The History of the World in One Hundred Objects. I’ve been listening in when I can and it’s a cracker. 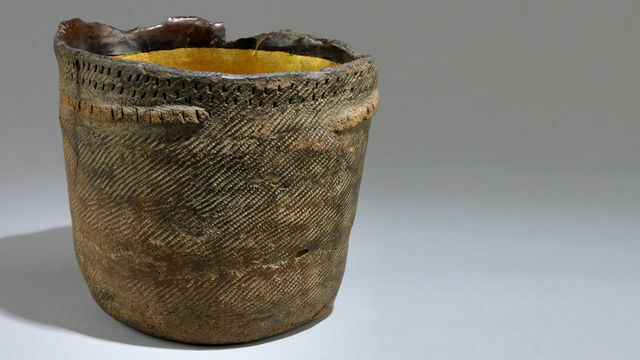 Today’s piece was a 7,000 year old pot from the Jomon area of Japan, thought to be where pottery started. It’s a great listen for potters. Follow this link if you want to but I’m not sure if you can listen from abroad. Great project, you can upload your own objects too, things that you think are important historically. Work wise today I have been mostly throwing black slip all over the workshop and I have packed a bisque for the first time this year. It feels like I haven’t managed to get very much done this week though it also feels like I haven’t stopped either, frustrating really. This entry was posted in BBC Radio 4, History of the world in 100 objects, Japan, Jomon. Bookmark the permalink. The BBC link streams fine in the States. Thanks for the heads up – great program. How coincidental! I was googling the Jomon period today because of all the coil pots I'm making looking for some shape inspiration. This one is wonderful! I'll try and give a listen, hope it works! I will have to give that a listen.We are firing our fisrt bisque of the year and it is crawling along! I was able to hear this and it was wonderful!! Thanks so much for posting. I am very interested in the Jomon pottery right now with my pit firings going on. v funny listening to the beeb! reminds me of kevin mc clound on that design series…very british! !cheers sweet.. Yes, we get it very well here in the US. I have downloaded others in this series and will put on my iPod to enjoy, also. Thanks for the link. The BBC does such wonderful programs.